OTL Blog » Blog Archive » Off the hook: 8th Buffalo infringement festival the most amazing yet! Off the hook: 8th Buffalo infringement festival the most amazing yet! “Infringe every day” was the mantra on everyone’s lips. The words were also prominent in performances, on posters and political buttons, and even on the enormous Trojan Buffalo that greets those arriving at the festival. 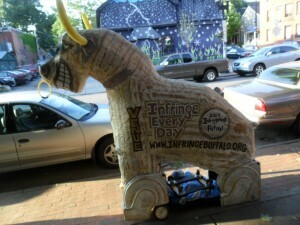 A light-hearted take on the Trojan Horse, a deceptive weapon from antiquity that put adversaries into the heart of enemy territory, the Trojan Buffalo not only symbolizes the entire festival but heralds a new chapter in the cultural war being fought in Buffalo, and indeed across much of the planet. At stake is the artists’ right to create and perform in an environment free from corporate manipulation and interference, and the 21st Century infringement movement promises to reclaim the culture and put a stop to parasitic corporate behaviours that compromise authenticity and agency in the arts. Having co-opted and neutered many authentic events, this corporate worldview continues pressuring the arts to transform into marketing opportunities for corporations. The most obvious example is the once-activist Fringe Festival, which is actually now trademarked in many jurisdictions, including Canada. The disturbing trend has even resulted in some of the Fringe Festivals being named after corporations, effectively devastating the original purpose of the movement and compromising the event. In stark contrast, the Buffalo infringement festival provides an authentic experience by serving up the real goods: boundary-stretching, mind-boggling and unfiltered arts straight from the community. Promising 11 days of “Art Under the Radar”, with over 800 performances and events in the 2012 edition, the normally-underground arts are exploding all over the city in a brilliant display of the empowering magic. Organizers proudly boast that “the annual Buffalo Infringement Festival provides artists and audiences of all backgrounds the chance to come together, take chances, push boundaries, and explore uncharted territory because exciting art can happen anywhere, anytime, without a blockbuster budget.” The proof is in the pudding: with the largest infringement festival to date anywhere, Buffalo provides evidence of what can happen when a community takes the culture into its own hands. Despite having a history of neglect, Buffalo is brimming with creative potential and the artists are forging ahead with a powerful new movement that reclaims spaces for culture and puts artists first. Simply put, it wasn’t only amazing – it was off the hook! 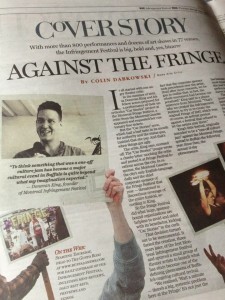 I went with Montreal-based Optative Theatrical Laboratories to perform three different shows and to take in what is arguably the greatest arts festival on Earth. With buskers on every corner and performances in every venue, the historic neighbourhood of Allentown transformed into what is essentially an infringement carnival – it became impossible to walk down the street without being overwhelmed by the vast amount of arts unfolding everywhere the eye turned. There was everything on offer from lively busking music, street theatre, block parties, and guerrilla film screenings, to burlesque shows, poetry, dance, random acts of infringement and even a Philosophy Stand run by a man named Magnum Opium where paradoxes are sold for only 75 cents. With so many shows and events on offer, it was impossible to catch everything amongst the incredible array. Festival-goers could enjoy everything from theatrical performances like 420: The Musical and Incident at Deer Lick to dance and burlesque shows like Euphraxia and Metamorphosis and Thank God for Lesbians to hot latino music from Clandestina y La Raza Cosmica, which played at the 9th Ward, a show-bar in the basement of a massive church saved by the wrecking ball by famous musician ani difranco. 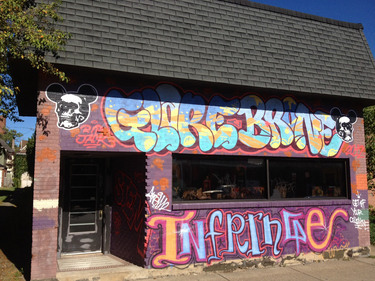 A plethora of visual arts in galleries was even complimented by graffiti arts, including one large mural that will promote the infringement meme year-round. 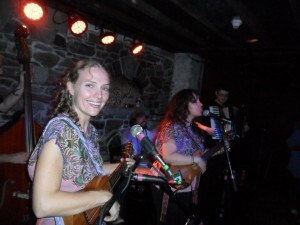 The artists and organizers are friendly and welcoming and the vibe is charged and entirely positive: it’s a model arts community with a strong activist flavour that dances circles around Montreal’s much-hyped but increasingly corporate and bland scene. Complimenting Buffalo’s outstanding arts scene is a remarkable arts journalism matrix whereby reporters tend to go above and beyond the call of duty to see and report on as much as possible. 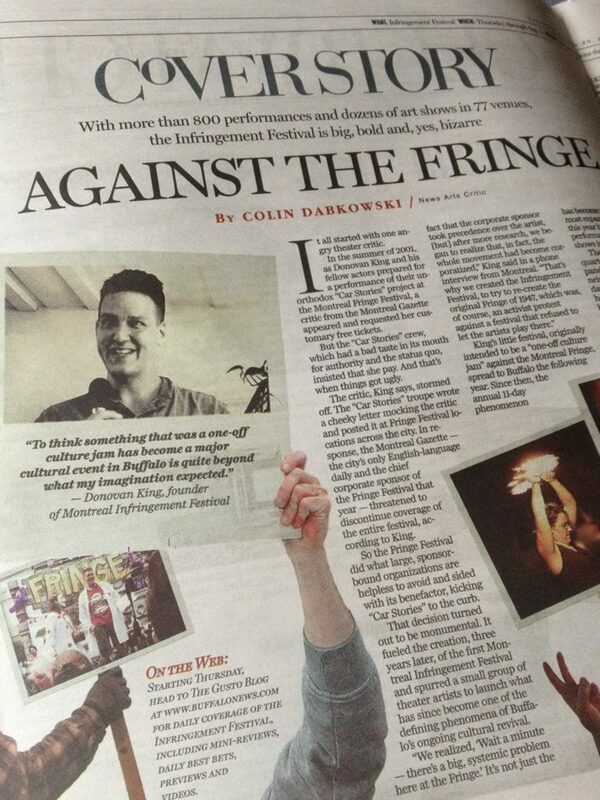 Colin Dabkowski of the Buffalo News is a case and point: not only did he write an edgy and detailed preview of the Buffalo infringement festival, but he has been on the ground every day, writing both recommendations for each of the eleven days, often followed up with reflections at the end of the day. He even produces thoughtful video interviews with the artists he met, including one about the history of the infringement festival with yours truly. Compared to the dysfunctional Montreal arts journalism scene where the infringement festival is blacklisted by various art critics and even the word “infringement” brings on shudders for large swaths of corporate media, in Buffalo the scene is harmonious. Buffalo arts journalists not only do their jobs professionally by reporting on all the arts (in Montreal they tend to only report on corporate artists and festivals), but they go out of their way to get to the bottom of a story. Instead of just plugging their pals, regurgitating press releases or writing nice words in exchange for wine and cheese, junkets, schmoozing with “celebrities” and other corporate favours, they engage with all artists and are actually part of the scene. 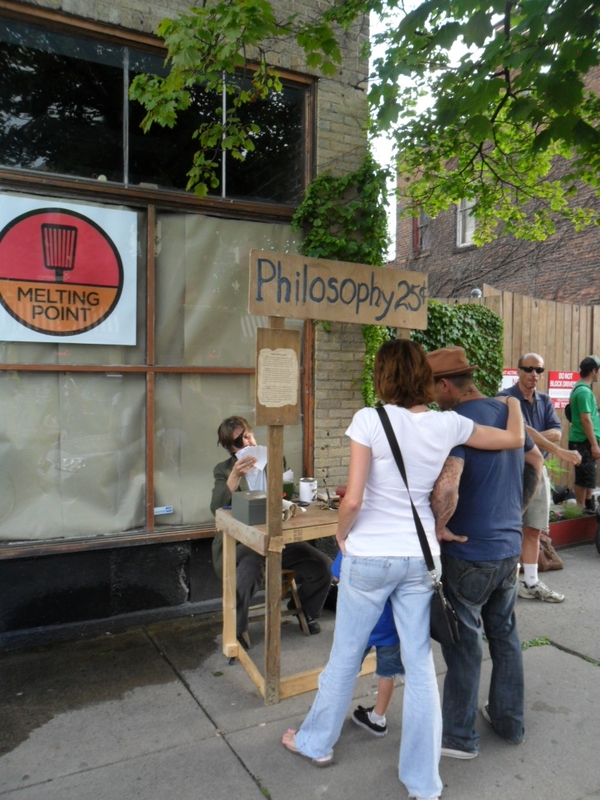 The Occupy Movement also played prominently into the festival this year, with various performances and events at the highly-activist Burning Books, such as Activist Theater by PUSH Buffalo, an organization that promotes sustainable housing in the city. 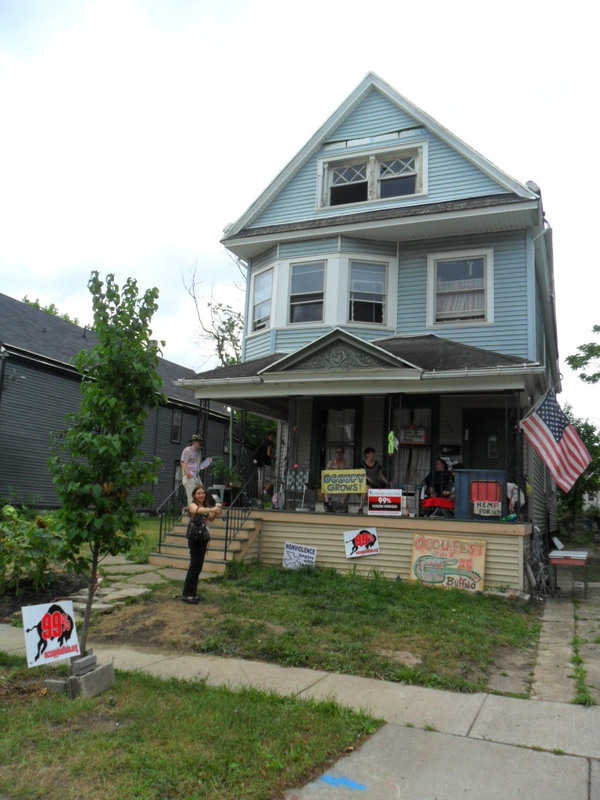 Other performances also took place at Occupy House, a run-down building inhabited by members of Occupy Buffalo (at the request of the owner, who is in the process of renovating several homes in the area). With arts and activism coming together so intimately at the festival, an unprecedented vibe is created whereby artists and spectators take ownership of this special and unique event in order to empower themselves. In the process of reclaiming the culture, infringers constantly challenge the relentless corporate status quo brought on by the mainstream and offer us a more human vision of the future: a place where people come first and corporations are firmly regulated to serve, instead of exploit, us all. Accomplishing this seemingly impossible goal begins with very small steps, and the “infringe every day” meme is a good place to start because it’s loaded with hope, agency, and cultural resistance. When enough members of a community embrace this activist vision and mission, cultural miracles like the Buffalo infringement festival become entirely possible! 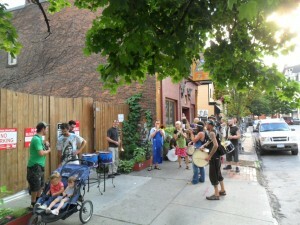 There can be no denying that infringement is the answer to the increasingly dysfunctional and corporatized arts being witnessed in places like the trademarked Fringe festival and cities, like Montreal, where administrators have allowed corporations to transform once-vibrant arts scenes into insidious marketing opportunities. Having attended the incredible 8th annual Buffalo infringement festival, I can only hope that the movement continues to spread, reclaim culture and empower other communities and artists across the globe. 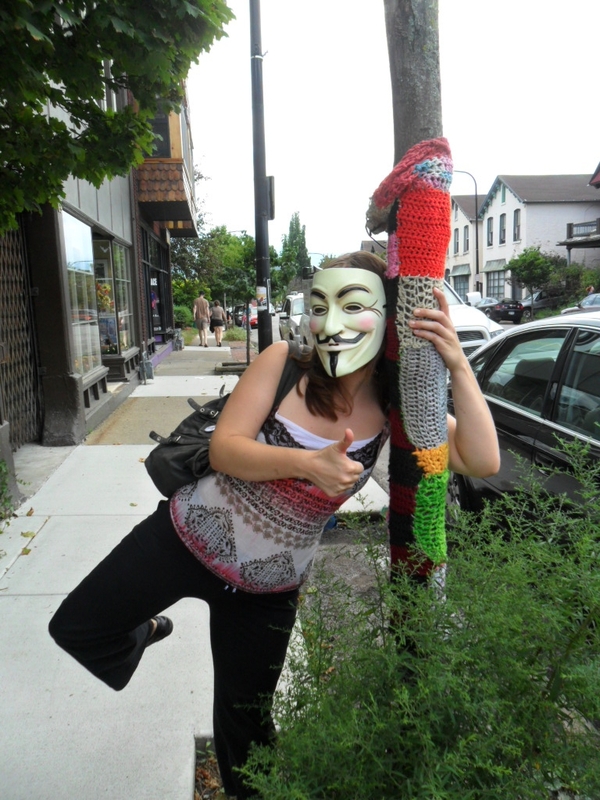 This entry was posted on Tuesday, August 7th, 2012 at 5:44 pm	and is filed under Activism, Community issues, General, Performance, Uncategorized. You can follow any responses to this entry through the RSS 2.0 feed. You can leave a response, or trackback from your own site.